Union Square will host a memorial and remembrance this evening to mark the one-year anniversary of Hurricane Maria. 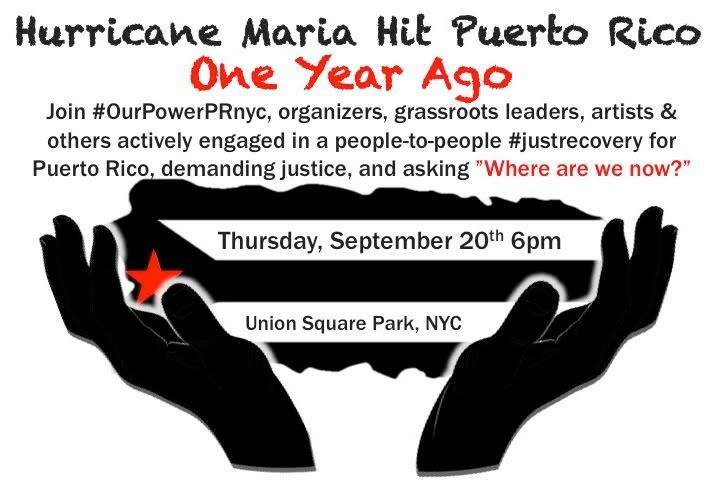 Join #OurPowerPRnyc, organizers, grassroots leaders, artists and others actively engaged in a people to people #justrecovery for Puerto Rico, demanding justice and asking "Where Are We Now?" In late August, Puerto Rico’s official death toll from Hurricane Maria was raised from 64, a number widely discounted as far too low as Reuters reported, to nearly 3,000. Maria caused property damage estimated at $90 billion and left much of the island without electricity for months. The recovery there remains agonizingly slow for many people. U.S. Representative Nydia Velazquez, a native of Puerto Rico, has said that "the federal response to the hurricane was disastrously inadequate, and as a result, thousands of our fellow American citizens lost their lives." She was among the assembled elected officials to speak out about the relief efforts during a press conference at City Hall this morning.